Hanoi (VNA) - Quang Ninh Coal hope to beat Singapore’s Home United in the third Group H match set for April 5 at the AFC Cup 2017 at the My Dinh National Stadium. Quang Ninh Coal are at the bottom with one point in the group. If the team wants to advance, they must win their two remaining matches. Home United rank second with three points and Yadanarbon FC of Myanmar are on top with four points. Earlier, Quang Ninh failed to register their first win at the Cup after losing 2-3 to Home United in Singapore. 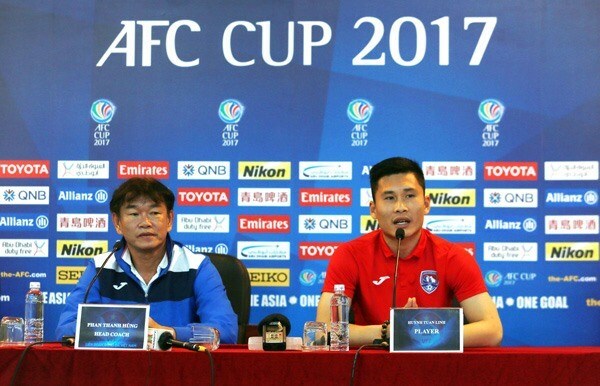 “We have only one point after two matches, however, we still have a chance to enter the event’s next round,” said coach Phan Thanh Hung. “We have prepared carefully for the game. We have enough skillful players to earn three points. The return of Thanh Hien is glad news,” Hung added. Goalkeeper Huynh Tuan Linh is very confident going into the match. Quang Ninh will be missing Thanh Hao and Nguyen Sa because of injury. However, Linh and captain Vu Minh Tuan are very strong after a long journey from Tajikistan to Vietnam. Linh and Tuan joined the national team to compete in the qualifying round of the Asian Cup 2019. “There are not any weak teams in the AFC Cup. Each team has private strong points. So do Yadanarbon and Quang Ninh Coal. We respect all rivals. For Quang Ninh, I think that they own as many quality players. Among them, I like Tambwe Patiyo, Vu Minh Tuan and Mac Hong Quan,” said Sahak.